Don’t miss Daytona Beach’s oldest beachside home, where history comes alive. The beautifully restored Lilian Place was built in 1884 by Laurence Thompson, one of the city’s first settlers. The house is named for his daughter Lilian (1873–1934), who lived there until her death. This historic home is a great example of Italianate High Victorian architecture — one of only two in Volusia County, Florida — and features high ceilings, crown moldings and heart-of-pine floors. Next to its narrow tower balcony, the house also features a “widow’s walk,” an outdoor platform designed for mariners’ wives to watch the sea for their husbands’ return. The sad name of this architectural detail came about because so many women waited in vain, only to later find that the sea had taken the lives of their missing men. Lilian Place actually sheltered one man the ocean couldn’t quite claim. In 1897, the writer Stephen Crane — perhaps best known for the Civil War novel The Red Badge of Courage — was traveling to Cuba to work as a journalist when his ship sank after hitting a sandbar. The press reported that Crane and three other men had drowned, but they were stranded at sea for 30 hours. They tried over and over to pilot their rowboat, barely big enough to hold them, through treacherous currents to reach land. Their tiny boat capsized during their final attempt, and one man died. Crane was taken in by residents of Lilian Place, where he recovered from his ordeal. He wrote the short story “The Open Boat” based on the experience, and many consider it his finest work. Ghostly sightings have been reported at Lilian Place over the years. The most frequent tales of visitation involve a mysterious woman in a white dress who has been named Lucille by Daytona Beach residents. There have also been reports of laughing children and a man resembling Stephen Crane. Most incidents have been reported in the bedroom where Crane recuperated from his near drowning in the inlet just beyond Lilian Place. The house was abandoned and neglected for many years, until it was acquired in 2009 by the Heritage Preservation Trust, a nonprofit group dedicated to historic preservation and education in Volusia County. Lilian Place has been fully restored and is now furnished with period furniture and artifacts. Visit the Lilian Place website to view a video history of the historic home that the Trust has produced. Next door to Lilian Place is the Hotchkiss House, a grand Queen Anne Victorian turreted mansion built in 1905 for Eliphalet Hubbell Hotchkiss. Tours are not available, but you can visit the house overlooking the Halifax River during Victorian Teas served by historic reenactors on the third Tuesday of each month, or at one of the Historic Preservation Trust’s Winedown Wednesdays. For details, visit the Historic Preservation Trust event calendar. 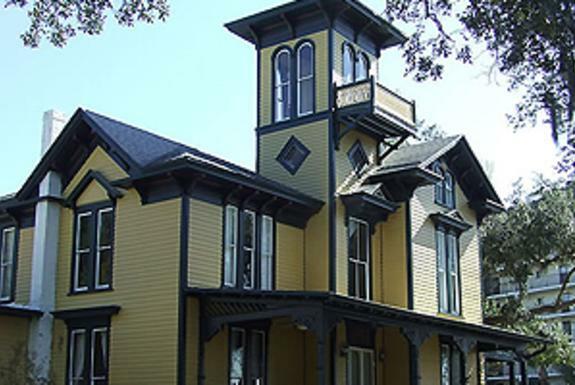 Don’t miss this historic house on your next trip to the Daytona Beach area — plan your trip today!